The future of simplified and clear video communication is here thanks to the new Crestron UC Video Conference Smart Sound Bar & Camera system! Now is the time to stop low productivity and wasted time in your business caused by your outdated teleconference and legacy video conference systems. These outdated systems are forcing your teams to fly between cities or even countries for that vital customer and internal staff meetings which need to happen more frequently and without any delays. While you waste your time travelling between cities and to other countries, your competitors are delivering their services and products to your customers via crystal clear video collaboration systems. More frequent face time with customers and teams will improve sales and productivity. Don’t waste your limited time this year. What makes the Crestron UC Video Conference Smart Sound Bar & Camera so amazing is the fact that no additional microphones, speakers, or camera are required because it is all built into the soundbar. Mounted on the wall beneath your display the Crestron UC Soundbar looks great and sounds even better. Its high-powered stereo speakers, adaptive beamforming microphone, and advanced Crestron Avia™ digital signal processing deliver exceptional speakerphone performance with profoundly clear, echo-free voice clarity. Its compact, all-in-one design reduces clutter on the conference table, and even accommodates rooms with no meeting room table at all. 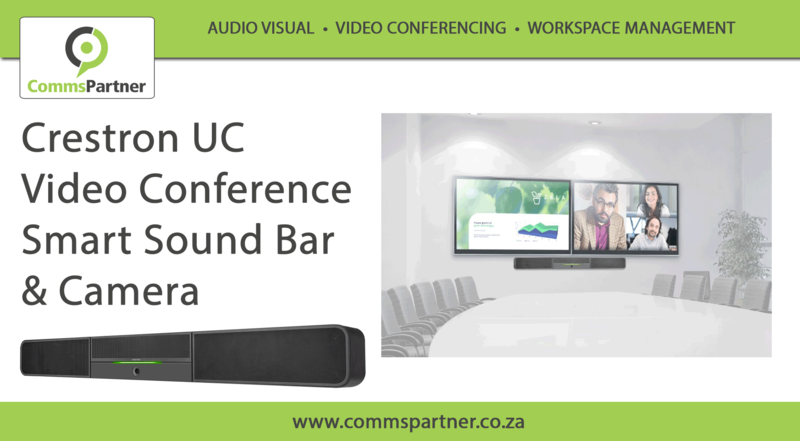 The new Crestron UC Video Conference Smart Sound Bar & Camera is a revolutionary all-in-one front-of-room device that makes video conferencing effortless. It is the perfect solution for huddle rooms and medium-sized meeting rooms that you want to upgrade into a video collaboration space. This feature is not utilised as part of a Crestron Flex system. Requires Huddly™ software or other software that supports this feature. Ready to take the next step? Want to work with our professional team to assist with your project? Consultation Services. We will identify the correct solution for your project. Design Services. We can quote on a suitable solution for your project due to access to a full range of professional brands from around the world. Project Management Services. We will deal directly with your Interior Designer, Architects, Electricians or Electrical Engineers to ensure a successful project. Installation Services. In addition to South Africa, we also have installation and support teams in Kenya, Mauritius, Namibia, Rwanda and Uganda, making any size Corporate Audio Visual, Video Conferencing and Workspace Management project possible throughout Africa. Preventative Maintenance and Service Level Agreements. 3-Year Guarantee on all installation and programming work. And a whole lot more! Contact us today for a free consultation meeting.